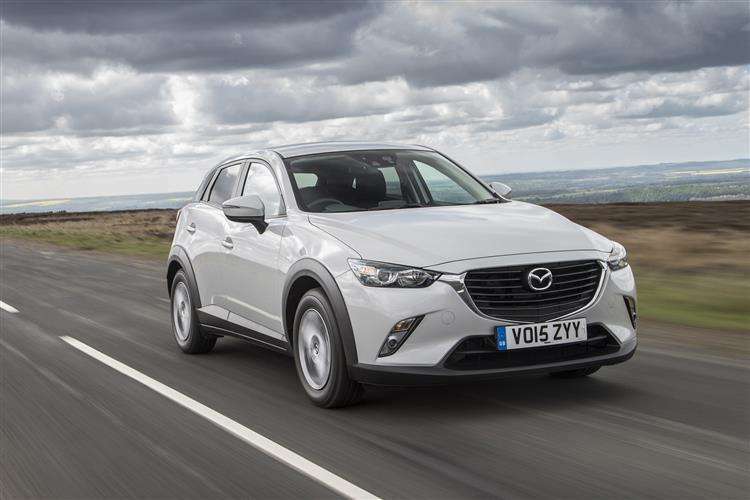 Mazda pulls out all the stops and condenses all the best bits of the gorgeous CX-5 into a smaller package. 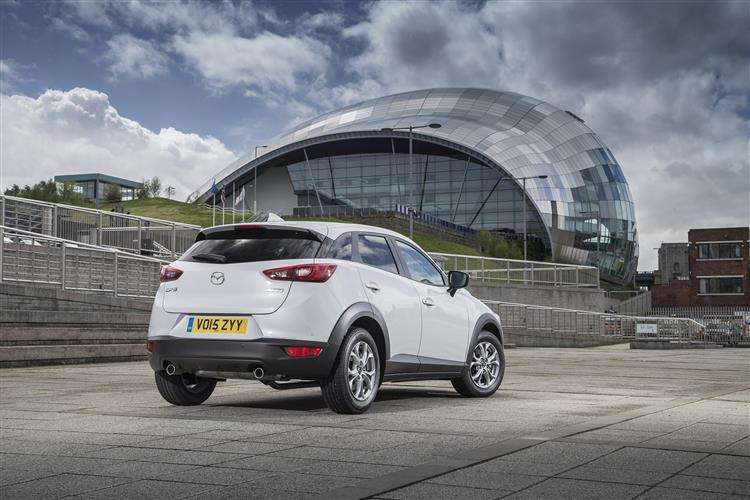 The CX-3 comes in front or all-wheel drive, and is offered with petrol or diesel power. It's light and it's good looking, with a chunky equipment list and reasonable pricing. What more could you ask for? These days, if you're a car maker and design a supermini, then you really have to create a small Crossover from it too. You know, one of those small Nissan Juke-style models that offer extra attitude, a bit more usability, a higher ride height and something of an SUV feel. The market's full of them, this being Mazda's contender, the CX-3. Here's a model very much in tune with this Japanese brand's current vision for automotive design - it's so-called 'SKYACTIV' philosophy that's all about creating cars that are light, efficient, pretty and, above all else, fun to drive. The market could do with a small Crossover like that. In the metal, it looks an energetic little thing and Mazda promises us it'll drive that way too. We'll be putting that to the test but if the SKYACTIV dynamics are delivered as advertised, then this will be the first small Crossover to match the class-leadingly agile Nissan Juke in that respect. There's a lot of promise here then, underlined by connectivity and cabin quality carried over from the little Mazda2 this model's based upon. CX-3 ownership also comes with premium pricing though and most sales will be of a petrol model with an engine much larger than buyers are used to seeing in this segment. So, can it all add up? That's what we're here to find out. 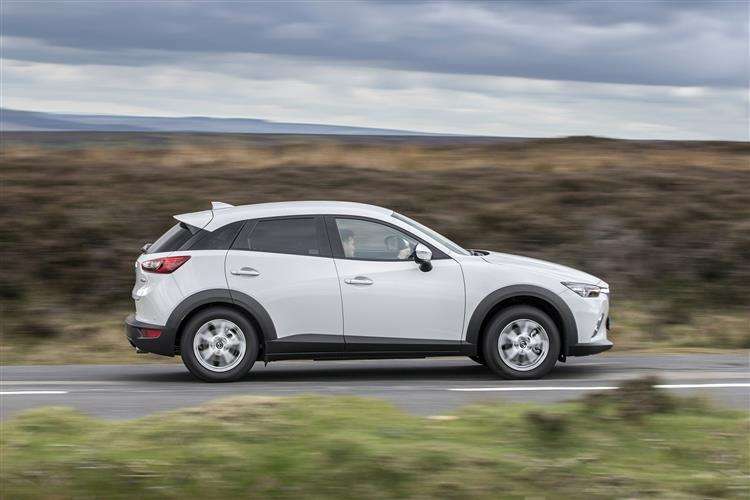 Like most crossovers in this class, the CX-3 is offered with a choice of front or all-wheel drive chassis, and petrol and diesel engines. The petrol engines comprise 120 or 150PS 2.0-litre units which together will account for around 50 per cent of UK sales. Available in all trims, with both manual and automatic transmissions, the 120PS powerplant with front-wheel drive is sure to be the most popular petrol variant. The 150PS petrol unit is mated to an all-wheel drive chassis and a six-speed manual gearbox in Sport Nav trim. The 105PS 1.5-litre diesel engine will power predominantly front-wheel drive models, although the range-topping Sport Nav is all-wheel drive and is also offered with both manual and automatic transmissions. Mazda's SKYACTIV design ethos strips unnecessary weight out of the engines, body, chassis and transmissions and while this sometimes means that road noise is a little higher than some rivals, huge paybacks come in sharper handling, stronger braking, keener acceleration and better efficiency. 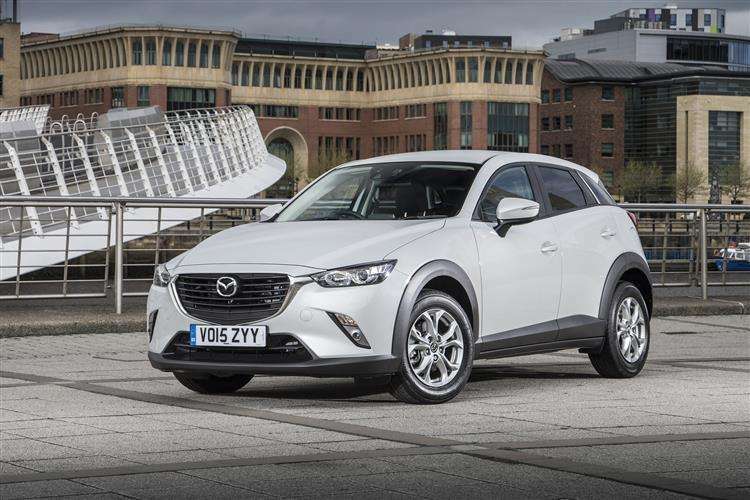 Is there a better-looking compact crossover than the Mazda CX-3? If there is, we don't think we've seen it. All too often, cars in this class look gawky, too stubby, too tall and too narrow, with strange, hall of mirrors dimensions. Somehow the CX-3 just looks right, thanks to its cab-back body and long bonnet proportioning. The predatory headlights are anything but cutesy and the coupe-like roofline gives it a real sporting stance. Materials quality will be better than you'll expect if you haven't parked your posterior in a Mazda for a few years and the cabin is more spacious than any car this short (and with such a long bonnet) has any right to be. In fact, we ended up wondering how its rivals were getting beaten time and again on various interior space metrics by the CX-3. But they were. There's a flexible cargo board boot floor, which can be lifted to provide a flat load space when the standard 60:40 split fold rear seats are tumbled. 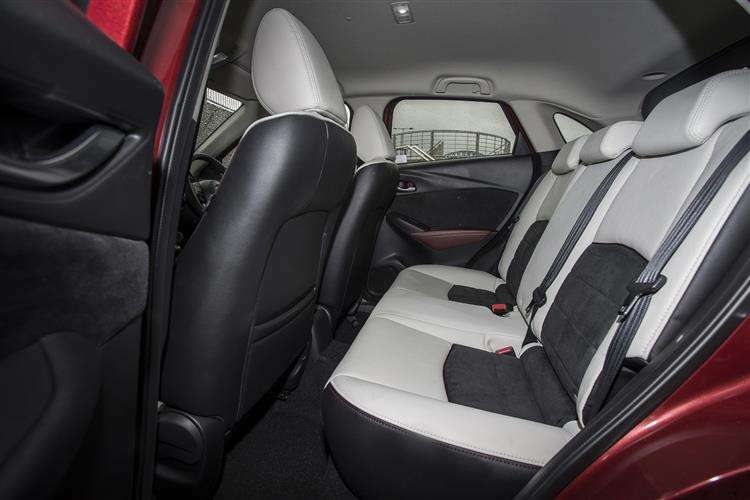 The reason why rear seat space is so generous becomes apparent when looking into the CX-3's fifth door. The 350-litre boot isn't anywhere approaching class-leading. For the sake of comparison, a Nissan Juke offers 354-litres, a Vauxhall Mokka 362-litres and a Renault Capture 377-litres. Prices start at under £18,000 and top out at just under £25,000. The entry-level SE models get 16-inch alloy wheels, plus heated and power folding mirrors, while SE-L models add rear privacy glass and front LED fog lights. At the top of the range, the CX-3 Sport Nav is the first car in the class to come with LED headlights. With LED rear lights,18-inch diamond-cut alloy wheels and chrome accent door sills it's sharp looker. All models get a 7-inch colour touchscreen, cruise control, DAB radio, Bluetooth and a multifunction steering wheel, while Sport Nav models also feature navigation with 3-years free European map updates, a reversing camera, Bose surround sound, smart keyless entry and a head-up display. Choose an SE-L model and you'll find heated front seats, rear parking sensors, automatic climate control and rain-sensing wipers. There's a full complement of airbags, including curtain bags. 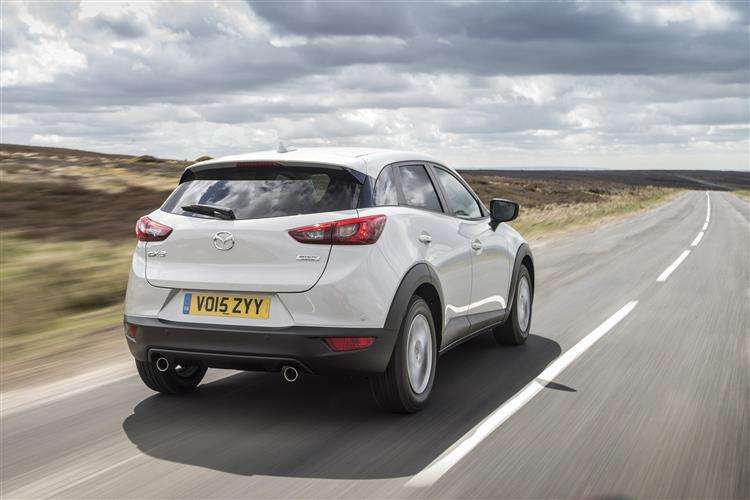 Hill Hold Assist, Tyre Pressure Monitoring System and Dynamic Stability Control are standard across the range, while SE-L and Sport Nav models feature Mazda's Lane Departure Warning System and Smart City Brake Support. Mazda's almost fanatical devotion to stripping unnecessary weight out of its cars means that although many of its cars look pretty substantial, they can weigh as much as a car in the next class down. This has all sorts of beneficial effects, not only in terms of vehicle dynamics but also when it comes to efficiency. Case in point: the CX-3 front-wheel drive diesel variant. With emissions of just 105g/km, this model has an official combined economy of 70.6mpg. That's what many would expect from a tiny citycar rather than a crossover that can seat five. If the CX-5 is used as a yardstick, residual figures will also be healthy. Insurance figures are also going to be reasonable as, thanks to that light weight, you get respectable performance without having the sort of horsepower figures that make insurance companies nervous. Buying a supermini-based crossover usually boils down to one key question. "Will I look a prize plum behind the wheel of it?" All too often the answer is yes, and buyers instead choose a more anonymous supermini alternative that doesn't draw attention to itself. The Mazda CX-3 has enough about it that it never looks self-conscious or try-hard. The styling works, the brand is solid and sensible with all the right engineering credibility and the product itself is unexpectedly delightful. Unexpected, that is, if you'd never tried the CX-5. Mazda really just needed to deliver more of the same in a smaller package in order to succeed and that's exactly what they've done. Yes, it has a broad range of rivals, but how many of them are going to pass the plum test? Think on that one for a while.